Anglican priest Glandion Carney is currently battling Parkinson’s disease. Throughout this book he guides his readers through the different struggles he has faced, and he provides insight to solutions at the end of each chapter. Some of the topics Carney faces deal with grace, submission, relinquishment, compassion, vulnerability, simplicity, and hopefulness. The Way of Grace can be read as a devotional because of the specific way it was written. Carney shows his readers the cold hard truth of living with Parkinson’s disease and how it affects his everyday living. The realistic problems he faces make way for a genuine and compassionate case study. Marjean Brooks also provides phenomenal words of encouragement and fills in the gaps of Carney’s sentence fluency as they both grab their readers and show them how God’s grace can be proven in any given situation. Any Christian dealing with a crippling disease or disorder. 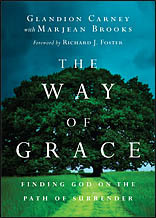 The Way of Grace teaches its readers that it is okay to be a bit confused when coming across bumps in the road. Our lives are not always perfect, but God makes sure never to give us more than we can handle. This book challenges readers to think about their own personal lives and how they can use grace to the best of their ability. It is easy to think about improving lifestyles when considering how in-depth this book gets with understanding God’s grace.